SCP-234 is contained at Site-██, Chamber ███. Artifact is anchored to its pedestal with nylon rope within a cylindrical viewing booth that is 3 meters in diameter. Booth is constructed out of transparent ballistic acrylic plastic. Four lightning rods direct the artifact's occasional electric discharge into the insulated chamber floor. When SCP-234 is not being tested, blast shields are to remain in place around the booth to both block visual contact and secure the artifact's position. Per revised containment procedures, female personnel are no longer allowed access to SCP-234 outside of approved testing. On-site security must be exclusively male and be stationed outside the twenty meter perimeter outside the viewing booth. Revised containment procedures have thus far prevented any further damage associated with the artifact's abnormal behavior. 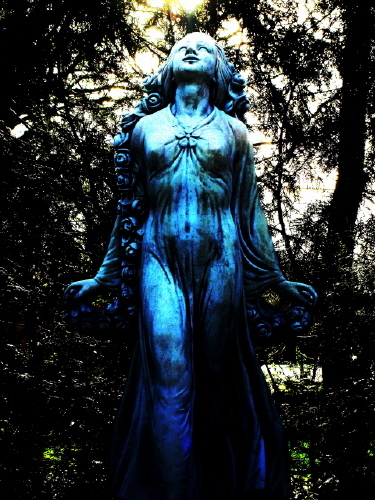 Description: SCP-234 is a statue of a woman wearing flowing robes carved from a single lapis lazuli stone. It was recovered from ███████████ on the 8th of March 19██. Locals had secretly maintained an all female cult devoted to the care of the statue as a goddess figure. Records recovered from the cult's hidden place of worship suggest that the cult had been maintained for at least ████████████████████████████████████ ██████████████████████████████ ████████████████████████ ███████████████████████████ ██████████████████████████████ ███████████████████████████, noting that lapis lazuli is not commonly found in this area. When agitated by certain stimuli the artifact has been recorded to levitate, spontaneously generate high amounts of electricity and act in an apparently aggressive manner towards male observers. However, repeated testing has failed to demonstrate any measurable degree of sapience or sentience in the artifact. It remains unknown what exact circumstances cause the artifact to react in this manner, testing has been suspended since Incident 234-92 and the resulting damage to the previous containment chamber. Addendum: Females exposed to SCP-234 report increased feelings of well-being, contentment and confidence provided they are alone or in the company of other females. Males exposed to SCP-234 report increased feelings of hostility and defensiveness. The feelings of hostility are extended to any females also exposed to the artifact when males are present. Females report strong urges to drive male viewers away by any means necessary, including violence. Female viewers who are alone when exposed to SCP-234 experience a desire to make physical contact with the artifact. See attached document re: Incident 234-92. Unless further testing is approved, SCP-234 is to remain sealed and blocked from view.